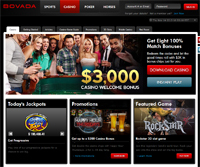 Formerly known as Bodog, Bovada is among the oldest operational online casinos in the world. Established literally last century, Bovada has been providing excellent service and a quality product for over 17 years and counting. You don’t stay in the internet gambling business for such a long time if you did not offer some of the best experience around. The software Bovada Casino uses is loosely based on the RTG one, but it is more proprietary – there are many slots and other games which are available only at Bovada, along with progressive jackpots and some table variations specific to this online casino. There fore if you want to try some casino games not available anywhere else, Bovada is a great place to choose. For a while the only critic of the Bovada Casino was their welcome bonus, which was only 10% on your first deposit, but now the casino finally came around and is boosting a sign-up bonus of up to $3,000 free. The bonus is divided into eight consecutive offers, each worth from $250 to $500, which makes this a great online casino for those who don’t want to deposit large amount of money, yet want to get a big bonus. To make things even better for the customers, Bovada is the online casino with the most ongoing bonuses and promotions – there is always something going on, free chips are given away on a weekly basis and chances are that if you are frequent player, you will always open your account to find some free casino chips had been added by management.